Honor a loved one with this fireside basket that makes an unforgettable tribute. 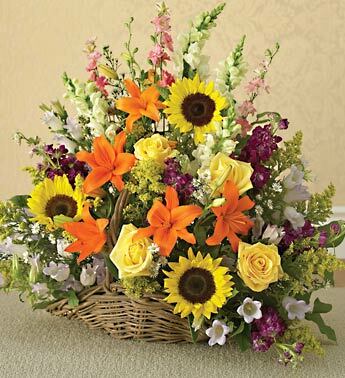 Lilies, sunflowers, yellow roses, snapdragons, larkspur and more. This particular style of floor basket arrangement is traditionally sent by family, friends or business associates. Delivered directly to the funeral home. Due to the urgency of the occasion, the freshest flowers available so varieties and colors may vary.